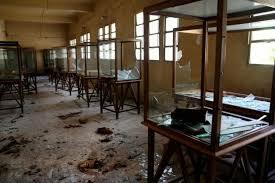 Egypt’s Malawi National Museum, located in the Upper Egyptian city of Minya, has been damaged and many pieces looted by rioters in the recent deadly clashes widely reported last week. On Wednesday, August 14, Egypt witnessed nationwide violence that left over 600 people deal and tens of thousands injured. The bloody fighting occurred as police cleared sit-ins by supporters of ousted President Mohamed Morsi at Rabaa Al-Adawiya in Cairo’s Nasr City district and Al-Nahda Square in Giza. With turmoil in Egypt far from over, what are the next immediate steps in managing this situation? On the home front, Ibrahim stated that a committee of experts and archaeologists are inspecting the losses and identifying the number of stolen artifacts to compile a list to send to the Prosecutor General to begin investigation. The list will also be distributed to Egyptian ports to prevent smuggling. 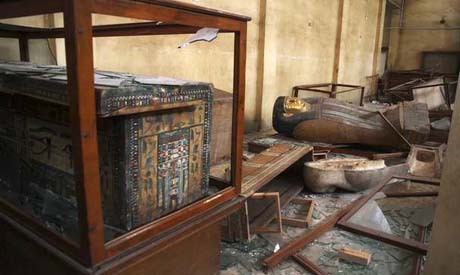 As of this morning, Ahram reported that Ahmed Sharaf, head of the Museums Department at the Ministry of State of Antiquities (MSA), stated that damaged pieces–including five painted wooden sarcophagi, two mummies, a hand-written papyri, and a collection of broken ancient Egyptian, Greek, and Roman statues–have been sent to the Al-Ashmounein archaeological galleries. Apparently, they were too heavy for looters to carry. On the international front, UNESCO and Interpol are planning to add the artifacts to the Red Lists. Maintained by the International Council of Museums (ICOM), the Red Lists compile listings of endangered archaeological objects and artworks in vulnerable areas of the world in order to prevent them being sold or illegally exported. Here, the hope is to identify and spread awareness of the particular objects taken, so that smuggling and illicit sale of these artifacts may be intercepted as quickly as possible. However, given the tragic and well documented destruction of Syrian antiquities arising from similar violence, it is likely that this story will only be one of many and that, like Syria, decimation of Egyptian antiquities will only increase.